Andy Bello has been selected as the Museum’s 2019 First Curator’s Apprentice. The National Bonsai & Penjing Museum's First Curator's Apprenticeship for 2019 is funded by generous grants to the National Bonsai Foundation from Toyota North America and The Hill Foundation. Bello, a 24-year-old Illinois native, earned a Bachelor of Science in Natural Resources Conservation and Management from the University of Arizona in 2016. He then moved to Eugene, Oregon where he designed and built ornamental ponds, propagated pond plants and bred koi and goldfish at a local store. His fascination with bonsai catalyzed after he stumbled across Peter Chan’s “Bonsai: The Art of Growing and Keeping Miniature Trees” in 2016. His readings prompted him to join the Eugene Bonsai Society, a group of Oregon bonsai enthusiasts. Bello said he felt welcome in the society, but after spending a year in the group he wanted to delve deeper into the bonsai realm and craved hands-on experience. His big break occurred on a trip to the Oregon Coast, when he inadvertently stopped at Driftwood Nursery in Bandon, Oregon. Bello befriended nursery owner Tom Roberts and soon began a monthly apprenticeship at Driftwood, where he learned basic bonsai skills and developed his passion for the trees. Bello said he and his girlfriend soon began to discuss moving east to solidify their careers and settle down close to family. In preparation, he explored available permaculture and organic farming jobs on the East Coast – eventually discovering the Museum’s curator apprenticeship – and immediately sent in his application. In his newly-appointed position, Bello aims to deepen his understanding of different species’ needs in all seasons, and looks forward to improving his horticulture skills and bonsai designs. His year-long internship will consist of performing various bonsai care-taking duties, from repotting and wiring to pruning, and spreading the joy and wonder of bonsai to Museum visitors. The National Bonsai & Penjing Museum's First Curator's Apprenticeship for 2019 is funded by generous grants to the National Bonsai Foundation from Toyota North America and The Hill Foundation. If you’d like to help fund these types of programs, please consider becoming a member of the National Bonsai Foundation. More information here. Board President, Felix Laughlin addresses crowd. 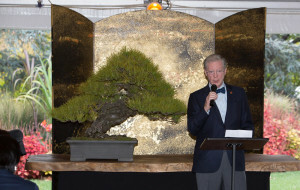 Last month, our staff, board members, friends, and supporters of the National Bonsai Foundation gathered to celebrate the long-awaited re-dedication of the Japanese Pavilion. The Japanese Pavilion was originally built in 1975 to house and display the 53 bonsai gifted to the American people for the bicentennial from the Nippon Bonsai Association on behalf of the Japanese people. After nearly 40 years serving as a symbol of peace, and hosting visitors from all over the world to view the historic collection, the pavilion was in need of renovations. The $2 million project was almost completely donor-funded, and the National Bonsai Foundation is so grateful to those who contributed, particularly Dr. Deborah Rose, whose generous leadership gift made the pavilion redesign possible. The new pavilion was designed by world-renowned Japanese garden designer Hoichi Kurisu. Kurisu’s design for the pavilion invokes traditional Japanese design concepts Shin, Gyo and So, featuring natural elements like boulders and running water. You can read more about Kurisu’s life, work, and vision for the garden here. At the October opening, guests heard remarks from Dr. Richard Olsen, director of the U.S. National Arboretum; Mr. Felix Laughlin, president of the National Bonsai Foundation; Mr. Takehiro Shimada, minister for communications and cultural affairs at the Embassy of Japan; Mrs. Naemi Iwasaki, chair of the Nippon Bonsai Association; and Mrs. Marybel Balendonck, vice president of the National Bonsai Foundation. Throughout the weekend, guests enjoyed other events like a presentation on the Japanese concept of wabi-sabi from Bonsai Master Seiji Morimae, who recently donated three trees to the Museum’s collection, and Bonsai Artist Peter Warren. The National Bonsai Foundation also hosted a dinner to honor Dr. Deborah Rose for her leadership gift and our guests from Japan, including Mrs. Naemi Iwasaki, the chair of the Nippon Bonsai Association. Finally, we were honored to welcome Mr. William Valavanis into the Bonsai Hall of Fame, presented by former Museum Curator Jack Sustic. The renovated Japanese Pavilion, along with the rest of the national bonsai collection, is open to the public daily from 10 am – 4 pm. (All photos by Colella Digital). If you’ve found a broken link or another issue, please send feedback to info@kendrarubinfeldpr.com.